METAL CASE-- Aluminium Alloy Case with Gold Plated HDMI Sockets Provides Good Anti-Interference and Makes the Sound Pure and Clear. 3 MODE-- Pass Mode: HDMI to HDMI; 2.1CH Mode: HDMI to 2.1CH R/L RCA ; 5.1CH Mode: HDMI to SPDIF/Optical 5.1CH. 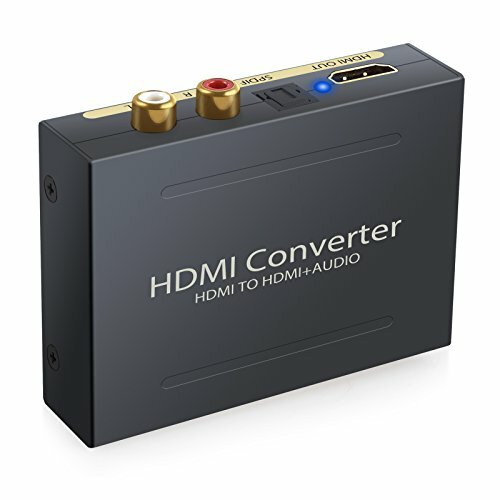 WIDE COMPATIBILITY-- Ideal for Blu-ray DVD Player, Xbox One, SKY HD Box, PS3, PS4, TV, Etc.